Intek's Armor Series urethane barbells, their highest quality fixed-weight barbells. Coated with urethane, the best material in the industry for protecting weights. The matte texture to the urethane coating keeps them looking like new, without any scuff marks like ones with smooth finishes are prone to. Includes one urethane coated barbell. Select your desired weight: 20, 30, 40, 50, 60, 70, 80, 90, 100, 110 lb. The full run of barbells from 20lb to 110lb are a convenience for users who are doing curls or a certain other exercises and want to be able to move to a different weight without messing with an assortment of weight plates and adjustable barbells. A full commercial quality barbell storage rack for all your fixed-weight straight barbells and fixed-weight curl barbells. Holds 10 barbells, 5 on each side. 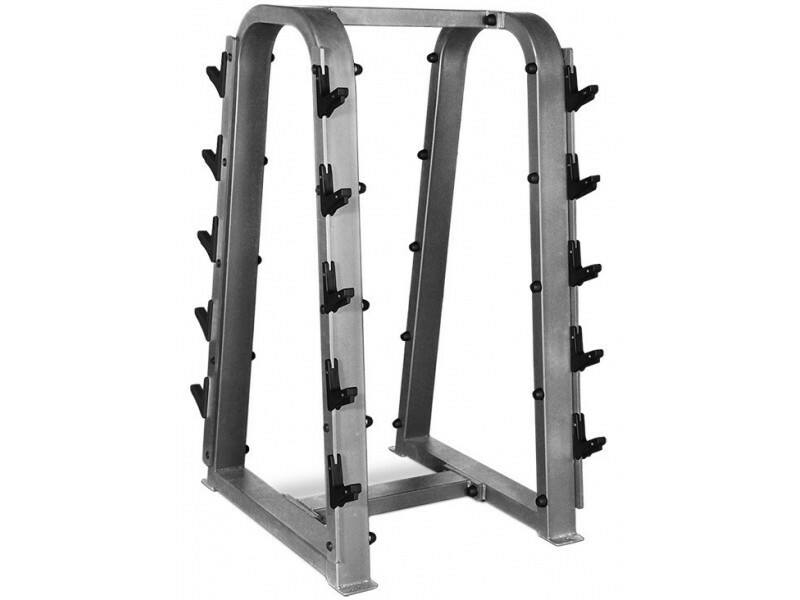 This is the most heavy duty fixed barbell rack we sell. It is significantly heavier than the York or Troy barbell racks.